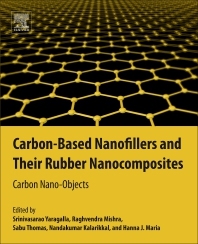 Carbon-Based Nanofillers and Their Rubber Nanocomposites: Carbon Nano-Objects presents their synthetic routes, characterization and structural properties, and the effect of nano fillers on rubber nanocomposites. The synthesis and characterization of all carbon-based fillers is discussed, along with their morphological, thermal, mechanical, dynamic mechanical and rheological properties. In addition, the book covers the theory, modeling and simulation aspects of these nanocomposites, along with various applications. Users will find this a unique contribution to the field of rubber science and technology that is ideal for graduates, post graduates, engineers, research scholars, polymer engineers, polymer technologists, and those in biomedical fields. Mr. Srinivasarao Yaragalla is a Senior Research Scholar at the International and Inter University Centre for Nanoscience and Nanotechnology at Mahatma Gandhi University, Kottayam, Kerala, India. He is engaged in doctoral studies in the area of graphene-based polymer nanocomposites. He has also conducted research work at the Universiti Teknologi MARA in Malaysia. In 2010, Mr. Yaragalla received a prestigious research fellowship administered jointly by the Council of Scientific and Industrial Research and University Grants Commission of the Government of India. He has published 6 international papers, two book chapters and edited one book to his credit. Raghvendra Kumar Mishra has received India’s most prestigious Visvesvaraya Research Fellowship(Department Information and Electronics, Govt. of India), and he is currently serving as Visvesvaraya Senior Research Fellow at the International and Inter university Centre for Nanoscience and Nanotechnology, Mahatma Gandhi University, India. He has completed his M. Tech. in Materials science and Technology at Indian Institute of Technology (Indian Space Research Organization, India). He has widely studied the processing of blends, in-situ generation micro and nano fibrillar composites, electromagnetic shielding effect of nanocomposites, decorating and alignment of carbon nanotubes and thermal, dynamic mechanical and structural relationship in polymer blends and nanocomposites .He has bagged several awards from different organizations and technology events. He has work as well research experience in Mechanical engineering, Materials science and Technology, and Nanoscience and Nanotechnology. His area of research is multidisciplinary which include Thermodynamics, Heat transfer, Refrigeration and Air-conditioning, Fluid mechanics, Machine design, Solid of Mechanics, Theory of Machine, Power plant engineering, Metal and Ceramic processing, polymers which include Polymer Recycling, Polymer blends, Fibre filled polymer composites, Particulate filled polymer composites and their morphological characterization, Ageing and degradation, Nanomaterials e.g. metallic , metallic oxide, Carbon nanotubes, Graphene, Conducting polymer blends, composites and nanocomposites, Biodegradable polymer blends and composites, Expertise in sophisticated characterization techniques such as Dynamic mechanical analyzer, Differential scanning calorimetry, Thermogravimetric analysis, Spectroscopy, Vector network analyzer, scanning electron Microcopy, Atomic Force Microscopy (AFM), etc.